Our Local Offer and Information Report can be found on our Policies page of this website. Please scroll down to the area of need that interests you and click on the headings. These will lead you straight to the online sites. If there is an area of need that is not yet included on this page, please see Mrs Lobban, who will research reliable and recognised sites, and add these to this page. This is the emotional bond between parent/ carer and child. It stimulates brain growth and shapes personality development and the life long ability to form Â relationships. This site explains the nature of the autistic spectrum. There are information sheets, including the A.S.C guide, children with aspergers, related conditions, recommended books, cognitive behaviour therapy. An additional sections offers answers for frequently asked questions. This provides information regarding symptoms of aspergers. The Social Skills software site, promotes a range of DVDs to support children on the autistic spectrum. Each DVD provides ‘Model me’ videos, that demonstrate a range of social skills. If you suspect your child may be on the autistic spectrum, you should seek professional advice. In order to receive professional support, you will require a diagnosis. The site below suggests relevant information your GP should gain in order to make a diagnosis. Some children are unable to eat wheat, gluten, rhy and barley. Below, are some links to useful sites with information about this. What diet can aid dairy and wheat intolerance? Some particularly relevant pages include a section for families and carers, and a section for people with Downs Syndrome. There are also links to local support groups. Locally, there is a Child Development Centre (CDC) at Dolphin House at Treliske Hospital. Here, there is a resource of trained and experienced professionals who care for pupils with Downs syndrome. Please note: this service is designed for parents who do not already have a named educational psychologist working with their child. Do you have a child with SEND? Are you aware of the support available for you and your family? The link below gives information of these services, including holiday support, sibling support and local events. Action for children This link will direct you to the Home page. Find OUR SERVICES, then DISABLED CHILDREN or FAMILY SUPPORT. There is a box to type your postcode and/ or town, which will direct you to local services. If you are in receipt of support from an Early Support Worker, please ask him/ her about services available for families during holiday periods. Below are links to national support organisations for Grandparents supporting grandchildren. This is a downloadable booklet signposting support services to grandparents who are raising grandchildren. This site is sub divided into age sections. each age section includes suggested reading books, age related developmental characteristics, support for helping your child read, and on line activities. use this site BUT remember to read real books! Click here to access some activities to help your child develop their phonological awareness. Easy Read. Does your child have difficulties learning to read and spell? Click on the link below to access this site, to help you support your child learning to read. In school, many of our pupils who struggle with reading spend time using Nessy. This is an ICT programme which supports the learning of spellings. There is now a Nessy website, so whether your child is diagnosed as at risk from dyslexia, struggles to acquire reading skills, or is a reluctant reader, log onto Nessy for some reading fun. There are also hints and tips how to support the learning of some aspects of maths. Special Educational Needs: Code of Practice 2014: this document highlights the rights and responsibilities for all concerned with young people from birth to 25, with a disability. Section 6 relates specifically to schools. A statement is not enough: Ofsted radical review and findings of SEN in UK schools. Rose Review: Review into reading, and recommendations for schools. If you have any concerns about your child’s health, please refer to the document using the link below. It explains how the school nurse can help our children. If you feel she can help, please arrange an appointment to see Mrs Lobban, SENCo. Does your child struggle making friends? Does he/ she have difficulty with social skills and building relationships? This site gives some tips to you, as parents, how you might support your child. We want our children to be happy at playtime. Here is a link to cards, with questions to discuss with your child if you are worried about how they deal with challenging playtime issues. Anger management snail This is a short power point to provide strategies to use instead of getting angry. Would be suitable for younger children. Calm down boy These are slightly longer power point presentations that tell the story of how a girl/ boy calms down from an angry situation, using a resource of strategies. Suitable for younger or older children. I suggest choosing the gender that matches your child. If you are worried your child may be suffering form bullying, this site offers bullying solution resources. PLEASE INFORM YOUR CLASS TEACHER IF YOU SUSPECT BULLYING AT SCHOOL. As a small school, incidents are rare, however, we need to be aware of any low level incidents of unkindness, so we can rectify it, for the benefit of all children. Good skills of speaking and listening an=re not only a life skill but can support learning in school. This document explains how to promote these skills. Days out at farms are an enjoyable and educational experience for many people. However, animals can carry a number of infections that may be harmful to people, especially children and pregnant women. Public Health England would like to take this opportunity to remind families who are visiting farms, how to avoid infections. Below are links to some useful information documents which might be helpful if planning family farm days out. It’s Down’s Syndrome Awareness Week and we know many schools are taking part in the Lots of Socks campaign on 21 March to help raise awareness of what Down syndrome is, what it means to have Down syndrome, and how people with Down syndrome play a vital role in our lives and communities. Here in St John’s, children (and staff) are invited to wear odd or fancy socks on Thursday 21st March. All children are also invited to enter the design a sock competition. Closing date is Friday 22nd March, when all entries will be judged. Winners in each class will be announced on Monday 25th March during Celebration assembly. For families affected by Down’s syndrome living in Cornwall, the Cornwall Down’s Syndrome Support Group has a whole host of resources and further information. Cornwall Youth Orchestra will present another FREE Inclusivity Concert on Thursday 11 April in Truro Cathedral at 1pm. Presented specifically for people who would not normally have the opportunity to hear live orchestral music, the concert is tailored to be autism, dementia and special needs friendly along with carers and family members. I’m very pleased to announce that Cornwall Youth Orchestra will present another free Inclusivity Concert on Thursday 11 April in Truro Cathedral at 1pm. Presented specifically for people who would not normally have the opportunity to hear live orchestral music, the concert is tailored to be autism, dementia and special needs friendly along with carers and family members. Over the last decade Cornwall Youth Orchestra have developed a reputation as one of the most energetic and musically inspiring youth orchestras in Britain. Their Inclusivity concerts have been widely appreciated by many people who might never otherwise get to experience the unique thrill and often deeply moving live sound created by an orchestra of 80 committed musicians working together. Truro Cathedral is an inspiring space in which to hear music too. The concert on April 11 explores musical pictures of real and imaginary places, some written in reaction to striking scenery and some relating to the inner landscapes of our minds. Music being performed includes Mendelssohn’s Hebrides Overture, Anna Clyne Night Ferry, Martin Riley Eden and then the rain, and Sibelius’ 2nd Symphony. The programme lasts about 1¾ hours including an interval. and to help us cater for everyone’s needs please register by emailing CYOconcert@gmail.com, letting us know how many people will be attending and if there are any wheelchair users in your group. It would be helpful to leave a contact phone number too. Please pass this letter on to anyone who you think might be interested. We would like everyone who might appreciate this opportunity to be able to take part. Looking forward to seeing many of you on April 11! Please read details of the Parenting Programmes locally. Parents are invited to attend any of these courses by booking through the Family Information Service on the booking form provided and send through to the Early Help Hub. 34% of children are leaving primary school overweight. As a positive response to this, Change4Life has launched a newcampaign, “make a swap when you next shop”, encouraging families to cut back on sugar. Please follow this link to theChange4Life website for some fun ways to implement small changes to maintain the health and well being of your families. This year’s theme is Healthy: Inside and Out – the children’s mental health charity Place2Be is encouraging everyone to think about how they look after their bodies and minds.Here are some resources you or your child might benefit from. As always, please see Mrs Lobban (SENCo) or your class teacher if you have concerns regarding the emotional health of your children. The Autism Spectrum Disorder Assessment Team at the Cornwall Foundation Trust will be running evening information sessions. These will run from January 2019 until May 2019 and are for parents and carers to tell you more about the ASDAT Team, the assessment process and what help is available while waiting for an assessment. The first session is Wednesday 16 January at 1pm at St Stephen’s Children’s Centre, Roydon Road, Launceston. Please see their flyer on the Cornwall SEND Local Offer Website for more information, how to book onto a session and more dates/venues/times. If your child has an epipen, please use the link below to read current advice. Please be aware that there is currently a shortage of Epipen and Epipen Junior. The staff at Hunrosa, a sleep consultancy based in Cornwall, are experts in resolving sleep issues and insomnia at any age. Sleep is crucial for emotional, mental and physical health and academic performance. They provide accredited Sleep Wise workshops including parent sessions. They can also deliver individual sleep assessments. They are trained by the NHS and are members of the British Sleep Society. Please visit the Hunrosa Website for more information. Public Health has provided guidance ahead of the approaching norovirus season, to ask for your help this winter, to reduce the spread of norovirus. We are writing ahead of the approaching norovirus season, to ask for your help this winter, to reduce the spread of norovirus. We hope the following points help to minimise the risk of outbreaks. We are also writing to GPs, district nurses, pharmacists, nurseries and childcare establishments and others. Norovirus causes viral gastroenteritis, which is characterised by the sudden onset of vomiting and/or diarrhoea, it can spread rapidly in closed environments such as schools, childcare settings, hospitals and nursing homes. However, most people do not require treatment and recover at home within one or two days. Norovirus is easily transmitted from person to person and by consuming contaminated food or water or by contact with contaminated surfaces or objects. Soap and water should be readily available. If someone develops symptoms of norovirus, please help avoid spread by following this advice. Exclude ill children and staff from school trips and residential trips, consider postponing during an outbreak. mental health in children is significantly on the increase. If you are aware of anyone who is suffering to the point of self-harm, here are some useful sites that can offer support and advice. This year, World Sight Day is drawing attention to eye care issues so that everyone, everywhere has access to good eye health. There are a wide range of visual impairments from severe sight impairment (blind) to sight impairment (partially sighted). As the implications of vision loss are different for everyone, a wide range of strategies may be needed to enable our young people to have equal access to the educational and broader curriculum. The next Better Together parenting session will be held on Tuesday 11 September at Ladock Community Hall. The session with cover courses that are available, networking opportunities, the fact and fiction about parenting courses and top tips. Phone: 07968 992495 or 01736 759058. Sarah Brown is a part of Action For Children’s TALK. This is 3 month pilot doing an online chat service, where parents/carers with children under 5 years, can access advice and support from qualified experienced practitioners with any issues they are facing such as behaviour, weaning, budgeting, teething etc. Talk leaflet This leaflet provides information that might be of help. Although scarlet fever is usually a mild illness, patients can develop complications and if you have any concerns please contact your local Health Protection Team for advice. Scarlet fever is a common childhood infection caused by Streptococcus pyogenes, or group A streptococcus (GAS). The early symptoms of scarlet fever include sore throat, headache, fever, nausea and vomiting. After 12 to 48 hours the characteristic red, pinhead rash develops, typically first appearing on the chest and stomach, then rapidly spreading to other parts of the body, and giving the skin a sandpaper-like texture. The scarlet rash may be harder to spot on the skin of some Black and Asian people, although the ‘sandpaper’ feel should be present. Patients typically have flushed cheeks and pallor around the mouth. This may be accompanied by a ‘strawberry tongue’. As the child improves peeling of the skin can occur. The next Passionate about Parenting Workshop being held at the Camborne Children’s Centre will run Monday 5 March. This is aimed specifically at EYFS parents and new parents, however it will support all parents, particularly if you are experiencing new difficulties coping with children’s behaviours. Please use the link below to find out more. The dates for the 2018 Challenging Behaviours Support Group for Parents and Carers in Penzance are now available. These free support groups are aimed at parents and carers who are finding their child’s behaviour difficult to manage. Please use the link below to find out more. Also, there is a new series of Oasis group sessions, provided by Scope, specifically to support parents of children with SEND. Please see dates on whole school dojo message, or on the school noticeboard. These booklets are developed each year to ensure any national or local changes to the National Child Measurement Programme (NCMP) are reflected and communicated clearly to parents. This booklet contains details about what to expect when your child participates in the health checks in YR and Y6. The process for opting children out of the health checks has been clarified by placing this form on the front page. Please remember; if a parent/carer does not return the opt out form your child will be included in all of the health checks, including the NCMP. Camborne Wesley Methodist Church to offer all parents the opportunity to 4 week parenting courses being run at the church throughout the year. Parents are invited to the first session as a ‘taster’ with no obligation to come back again. There are 4 courses planned through the year: The next opportunity is running on consecutive weeks from Monday 15th January to Monday 5th February from 19:00-20:30. Parenting courses are a great opportunity for parents to take time out to consider their parenting skills, learn new ones and share their experiences with one another. Cornwall Council has been working with Public Health England and other partners to produce an infection control and winter readiness pack to support schools and nurseries this winter. The information below may be of use to you. Fingers crossed for a healthy and absence from school free winter season! It might be useful or helpful to share these with your work places too. If you have a child with autism, or on the spectrum, or if you know a family with a child with autism, please share this latest news from the Pearl Centre. As you may know, our open sessions which we hold every month at the Pearl Centre are very popular and are often oversubscribed. We understand that at times it is hard to organise things to attend and last minute things happen resulting in you not being able to make it. Could we please kindly ask that if you have booked or do book in the future and for some reason, you can not make it that you let us know as soon as possible so that others may attend in your place. This would be really helpful to us, ensuring those that want to come can but also helps ensure we are not running open sessions with only 4 people when potentially 10-12 could attend. Our free Open Sessions are held once a month. They provide an opportunity for interested people to put their questions to our clinical psychologist and a behavioural expert. It’s a great opportunity to put the professionals in the hot seat, ask questions relevant to your situation or learn more about Autism. These sessions have proven to be very helpful in helping with questions you may have, signposting and information giving. They also provide a place to meet others in similar situations. Our next open session is on November 14th at 1pm This session currently is fully booked. The next session after this one will be in January. We have not yet confirmed the date but as soon as we do we will send the dates out. If you have a child aged 2 or 3, get them vaccinated against flu with the free nasal spray flu vaccine from your GP. School children from reception class through to year 4 will get their vaccinations through their school. Does your child find it difficult to sleep? Do you find it challenging supporting your child to settle to a good night’s sleep? SCOPE are running two FREE workshops to support children and parents with sleep difficulties. One in Truro on 19th October and one in Penzance on 10th October. During the week of 8-14 May, the Mental Health Foundation will be producing a new report to highlight the numbers of us who feel stuck on ‘survive’. They will be providing advice and insight into how we can build good mental health in the context of our work, our digital world, our parenting approach and in our communities. If you have concerns for your children linked to mental health, please contact Mrs Lobban. Foster Care Fortnight is the UK’s biggest foster care awareness raising campaign, delivered by leading fostering charity, The Fostering Network. It’s main aim is to recruit foster carers but it is also a great platform to showcase and share knowledge about the difference that foster care and quality support and education makes to the lives of fostered children and young people. If you would like to know more about the fostering service, or what it would involve to be a foster carer, please use the links below. We have a member of staff who is an experienced foster carer. Please contact Mrs Lobban if you would like to arrange a meeting with this member of staff regardng any aspect of foster care. Scope is a charity that actively supports parents and families of children with SEND. There are support networks locally, in addition to other services. These services are FREE and confidential, and include a befriender service, Face2face support among others. Please use the links below to see how this service may be of support to you and your family. Please see if there is support suitable for the age of your child. Additional information can be found using the links. These are FREE! Keeping our families and children healthy! Change 4 Life has now rebranded as Food SMART. The revised and updated website has lots of information about how to make manageable and positive lifestyle changes to support the health and well-being of you and your family. There is also a free app, with on the go info…. enjoy! On 15 December the Secretary of State for Health, Jeremy Hunt, launched a new sepsis awareness campaign, supported by UK Sepsis Trust, to raise awareness of the key symptoms of sepsis amongst parents of children aged 0-4. The campaign will be launched with a series of new videos explaining the key symptoms, fronted by campaigner Melissa Mead, and a number of other families affected by the condition, as well as the release of posters and leaflets below to help raise awareness. For more information visit www.nhs.uk/sepsis or sepsistrust.org. Cerebra is a charity to support parents and their children with sleep difficulties. If you are experiencing sleep difficulties with your child, use these links below. We all need a good night’s sleep, parents as well as children! SCOPE are offering sleep workshops in our area, for parents of pupils with sleep difficulties. Please access the leaflet using the links below for more information. Disability Cornwall has secured the contract for the Cornwall and the Isles of Scilly SENDIASS for the next three years. This service is independent of the Local Authority and is available to children and young people with SEND, their families and the professionals that work with them. SENDIASS provides information, advice and support for any child or young person aged 0-25 with a special educational need or disability and their parents and families. Their service is confidential, impartial, accessible and free. Linking parents/ carers and young people with local support groups and forums. Different people and groups have a range of experiences and views about what it means to live in Cornwall and have special educational needs and / or disability (SEND), to have a family member with SEND or to work with children and young people with SEND. Together we can draw together a shared understanding of SEND in Cornwall and have a clear view of what needs to happen next. Every part of the country has to have a Joint Strategic Needs Assessment (JSNA), evidence about what life is like. Cornwall Council wants to share this, and some broader SEND information, with a wide range of people so we can identify what is important to keep the same or to change in the future. Watch out for details about on line information when you will be able to say what your experience is like and identify what is important to you. The online survey will be live from 9 November to 9 December 2016. Prefer discussing face to face? Meetings have been arranged where there will be a presentation and opportunities for discussion and feedback. These are informal and open to everyone who has an interest in SEND. Pupils in Reception and Y6 are measured in schools every year. School will contact all parents with information about this. Please use the link below for further information. You may be aware that measles is circulating in many areas across the country; there continues to be cases in many parts of the South West. Transmission is occurring most in areas with a lower uptake of MMR vaccine; in particular parts of Devon, Somerset and Dorset. The majority of cases are of secondary school age but people of all ages are being affected. Following an outbreak in South Devon in the summer we continue to see the majority of our cases in Devon. 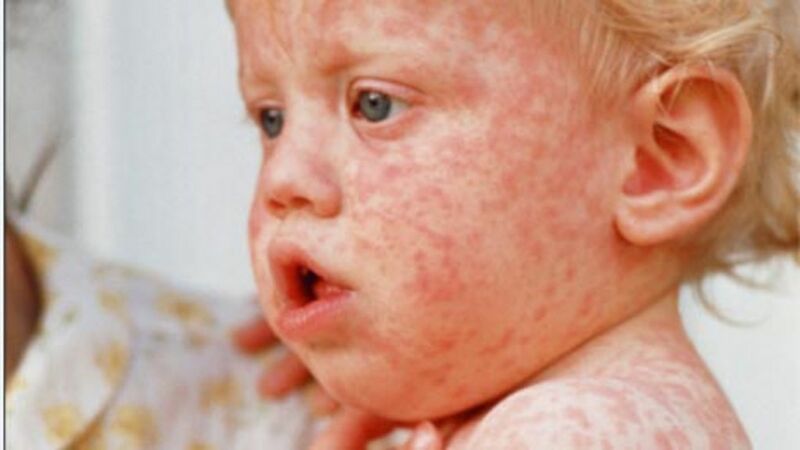 Measles is a highly infectious viral illness spread through coughing and sneezing and close personal contact. Most people feel very unwell but do recover completely from measles, however, on rare occasions there can be serious complications. The first stage of measles includes a runny nose, conjunctivitis (red eyes), a cough and an increasing fever that comes and goes. A rash appears on day 3 or 4 while the individual is still feverish and miserable. Anyone with suspected measles should be excluded from school or work until five days after the rash first appears. MMR vaccine offers a high level of protection against measles. The first dose should be given at 12 months of age and the second with the pre-school booster, but if these have been missed it is never too late to have them. Two doses are required to provide a high level of protection. This is important for the protection of the individual and also to protect those who cannot be immunised because of age, pregnancy or an underling medical condition causing immunosuppression. For these vulnerable people, measles can be a particularly serious disease. If you are unsure whether your child/children have been fully immunised, you can check with your GP surgery and make an appointment to receive any doses of MMR vaccine they may have missed to ensure they have the 2 doses to provide protection against measles and also rubella and mumps. MMR is also beneficial if given within 72 hours of exposure to the virus. If your children do have signs or symptoms of measles, please contact your GP to seek medical advice. Please telephone the GP surgery before visiting and tell the receptionist that the person may have measles so that the surgery can ensure that arrangements are made to avoid exposing other patients to a potential infection. Please note that scarlet fever is circulating in the community. This is to be expected in spring and early summer. Scarlet fever is a common childhood infection caused by the bacteria Streptococcus pyogenes, or group A streptococcus (GAS). The early symptoms of scarlet fever include sore throat, headache, fever, nausea and vomiting. 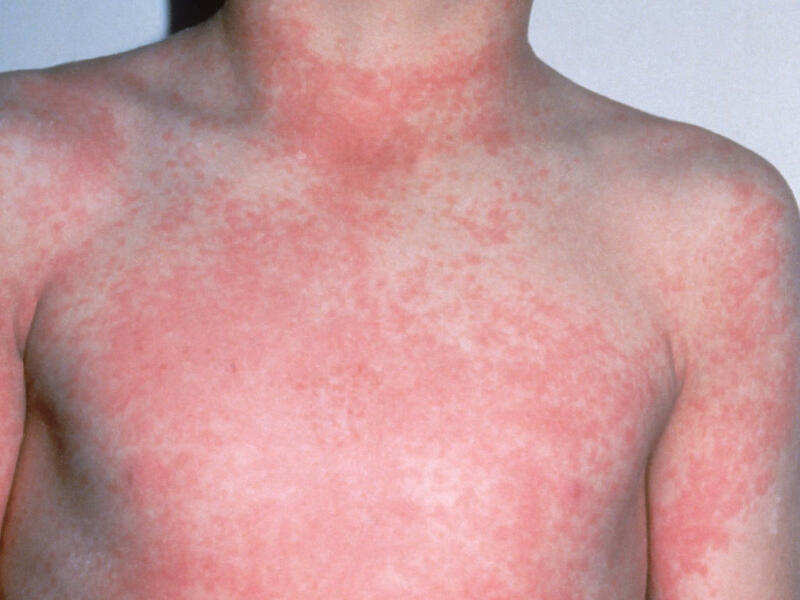 After 12 to 48 hours the characteristic red, pinhead rash develops, typically first appearing on the chest and stomach, then rapidly spreading to other parts of the body. If you have any concerns about your child, please seek medical advice from your GP. In the case of scarlet fever, children will be prescribed a course of antibiotics, for approximately 10 days. Infections can be spread through mucus secretions, aerosols and through shared contact with contaminated surfaces such as table tops, taps, toys and door handles. As per national Guidance on Infection Control in Schools and other Child Care Settings, children and adults with suspected scarlet fever will be excluded from school. They may return if they are feeling better but only 24 hours after commencement of antibiotics. The antibiotic course for scarlet fever is 10 days and it is important that the full course of antibiotics is completed, even if the patient has started to feel better. 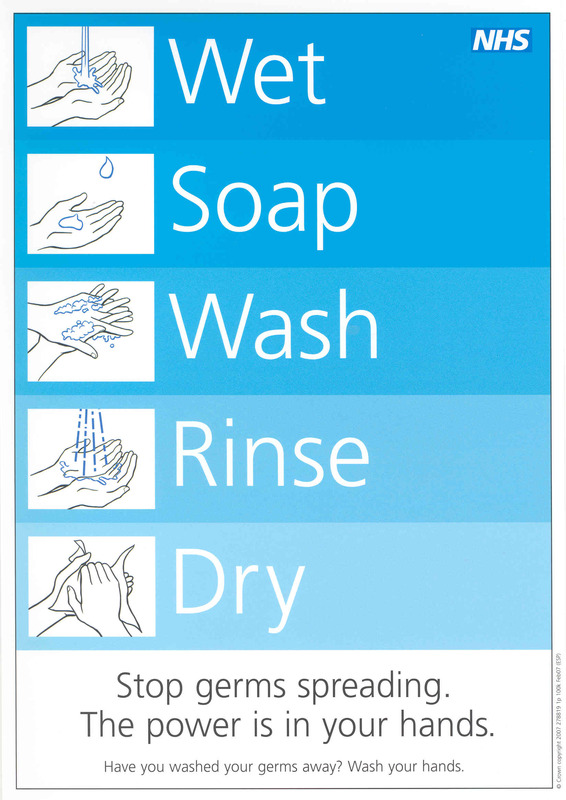 In addition to exclusion, good hygiene practice such as hand washing remains the most important step in preventing and controlling spread of infection. Flu is circulating the community. One of the circulating flu strains at present is H1N1, previously known as swine flu. As this strain is now not a pandemic strain, it should be treated like any other circulating flu strain as outlined below. • Hand washing is essential. It is really important to encourage your children to do this. • It is best to use warm soapy water and encourage a thorough handwashing technique. Further information about germs and hand washing is available at:http://www.e-bug.eu/. It contains games and other information to help children learn how to prevent the spread of germs. When a child is free of the symptoms of a flu-like illness they can return to school. This is usually about one week after the symptoms start. We understand that this can be difficult for parents with work commitments and childcare to manage. However, this will help us to reduce transmission of the infection.